One of the most enjoyable parts of my job with the Cape Cod Baseball League each year is to help produce three issues of Cape League Magazine, the league’s official publication. 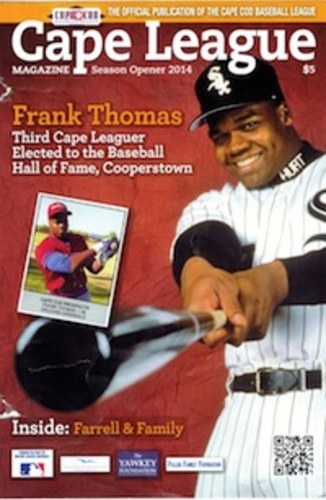 I just finished proofreading the Season Opener 2014 edition, and it’s a beauty, highlighted by John Garner Jr.’s in-depth cover story on Frank Thomas, the third Cape League graduate to be elected to the National Baseball Hall of Fame in Cooperstown, N.Y.
Two photos of Thomas (Orleans, 1988) grace the magazine’s cover – a great shot of the Big Hurt taken by Chicago White Sox team photographer Ron Vesely and an inset image of Thomas’ 1988 Cape League trading card. Coincidentally, the Thomas cover is the second straight to feature a White Sox player. ChiSox rookie catcher Josh Phegley (Wareham, 2007), the 1,000th former Cape Leaguer to play in the major leagues, appeared on the cover of the 2013 Postseason Edition last fall. Thomas, who will be enshrined in ceremonies on Sunday, July 27, joins fellow ex-Cardinal and former White Sox teammate Carlton Fisk (Orleans, 1966) and legendary Pittsburgh Pirates star Harold “Pie” Traynor (Falmouth, 1919) as the only Hall of Famers with Cape League backgrounds. Readers will enjoy Garner’s story, which includes comments from Orleans GM Sue Horton and former Orleans pitching coach Tom Yankus, both of whom have vivid memories of Thomas’ season with the Cardinals (Orleans didn’t change its name to Firebirds until 2009). Garner describes Thomas’ awesome display of power in his most memorable CCBL game and points out that Thomas also is a member of the Cape League Hall of Fame, inducted with the inaugural class in 2000. Other articles in the soon-to-be-available Season Opener 2014 issue spotlight the baseball family of Boston Red Sox manager John Farrell, previews of all 10 Cape League teams broken down by Eastern and Western divisions and an up-close-and-personal piece by Melissa Ellis, who describes what it’s like to grow up in a Cape League “host family” home, where college ballplayers become big brothers each summer. In the better-late-than-never department, the unofficial 2013 Major League Baseball All-Cape League Team is presented. It gives recognition to the best performances last season by Cape League grads in the big leagues, accompanied by photos of each of the 15 players. And for those who cannot get enough agate type, the magazine presents the all-time list of Cape Leaguers who played in the major leagues, more than 1,030 names from “A” (David Aardsma, Falmouth, 2002) to “Z” (Mike Zunino, Y-D, 2011). To reserve your copy of 2014’s first issue of Cape League Magazine, send a $10 check or money order made out to Cape Cod Baseball League in care of CCBL President Judy Walden Scarafile, 449 Braggs Lane, Barnstable Village, MA 02630. The $10 cost includes shipping and handling.